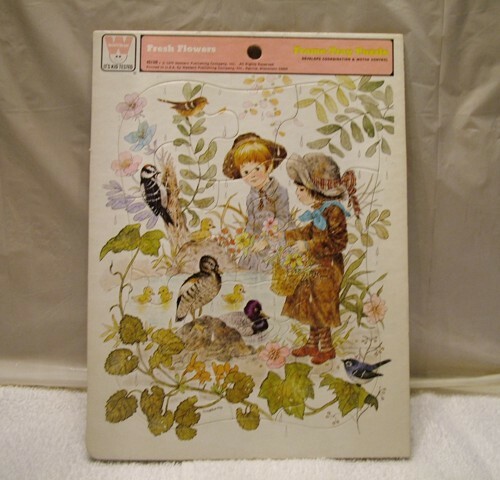 This puzzle has never been popped out of it's cardboard tray. 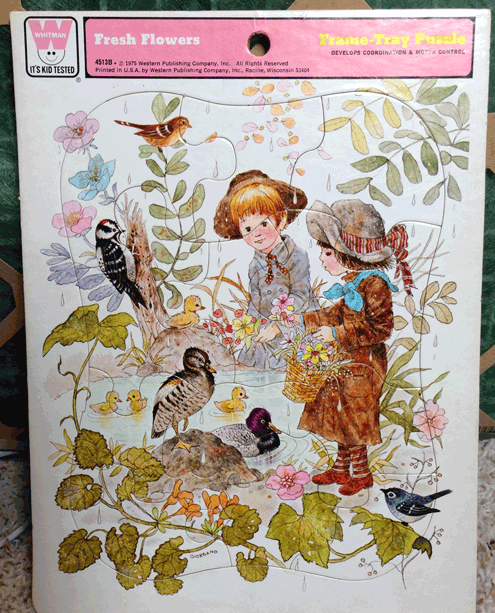 The picture is signed Giordano, and depicts two children, a boy and a girl, gathering flowers by a pond while a variety of birds surround them. There is a woodpecker, a sparrow, a bluebird, and two ducks with ducklings. 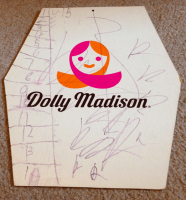 This puzzle shows signs of aging, but is in very good shape for being 40 years old. Here we have a 4 piece set of promotional cardboard cutouts. 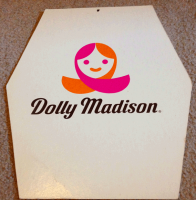 They have a hole at the top, where a string is threaded in order to hang them, free swinging, from the ceiling. There they can spin and dangle to display both the Dolly Madison Logo and the Peanuts Art. Each piece is marked with a copyright date, but the actual date these pieces were made is unknown. I do know they are at least 30 years old. 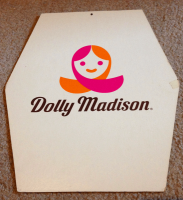 These cutouts were collected after being used for display, obviously by a young person. Two of them are ripped where clear tape was removed. Some of the cutouts still have clear tape attached to them. 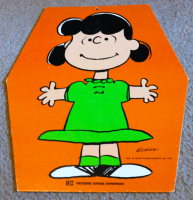 Lucy: By her left foot, the corner has the look of being bent - however the cardboard is firm and seems to be unbroken. The surface of both the back and front have a line that indicates bending. 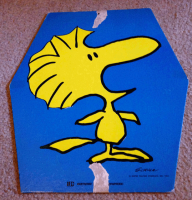 Woodstock and Charlie Brown are ripped at the top and bottom where the tape was removed. 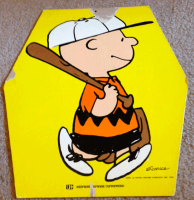 Charlie also has a torn spot on the edge undernesth the baseball bat, also apparently from tape. 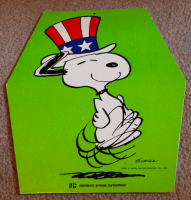 Snoopy appears to have been used as a drawing board, and you can see dents in the surface made from someone drawing on paper on top of it. The Dolly Madison side of Snoopy has purple ink with numbers and lines drawn in a child's hand. 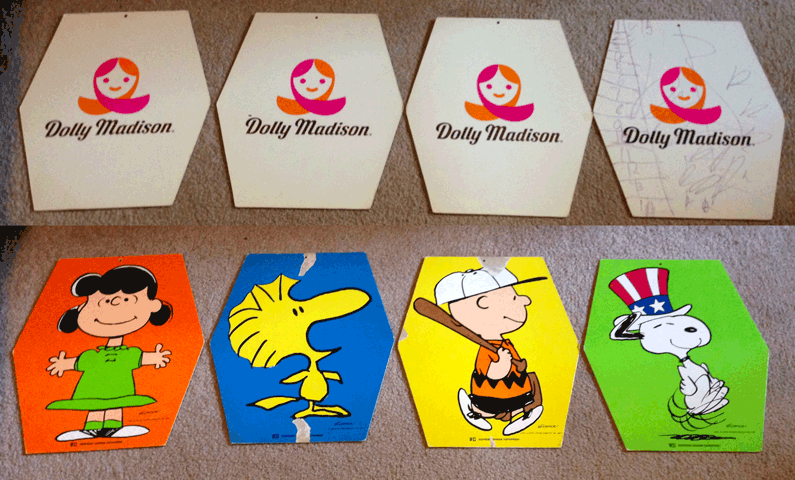 Regardless, these pieces are considered highly collectible, both as Dolly Madison and Peanuts collectibles. Each cutou is 11.5 x 10.25. The entire set weighs 10 ounces.